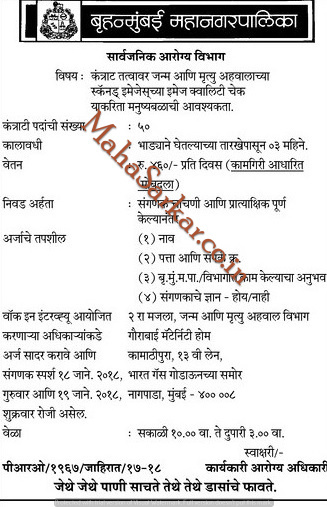 Brihanmumbai Mahanagarpalika (Municipal Corporation of Grater Mumbai), Mumbai Published Job Notification for 50 Manpower Posts. Candidates who wish to apply must look at Brihanmumbai Mahanagarpalika Manpower Recruitment 2018. Eligible candidates can join Walk-in Interview on 18th and on 19th January 2018. Education Qualification: Knowledge in Computer and More. For Post wise Education Details follow the detailed advertisement. Interested & Eligible candidates may attend for walk in interview along with all the documents addressed at 2nd Floor, Birth and Death Report, Department, Gaurabai Maternity Home Kamathipura, 13th Lane, Infront of Bharat Gas Godown’s, Nagpada, Mumbai-40000. Starting Date, Last Date to Apply Offline at Municipal Corporation of Grater Mumbai which candidates should be remember as follows. Walk-in Interview on: 18th and on 19th January 2018.